The weather's warming up and wedding season is right around the corner. If you're a bride-to-be, you're probably keeping busy with planning…and getting your figure ready for the big day! Aside from bridal shapewear that you wear under your gown, a waist training plan is a sure-fire way to make sure you're looking your best as you walk down the aisle (whether bride or bridesmaid!). For the best results, we recommend starting at least five months out. However, if it's a little late in the game, you can still start a waist training regime and see results in just a few weeks. 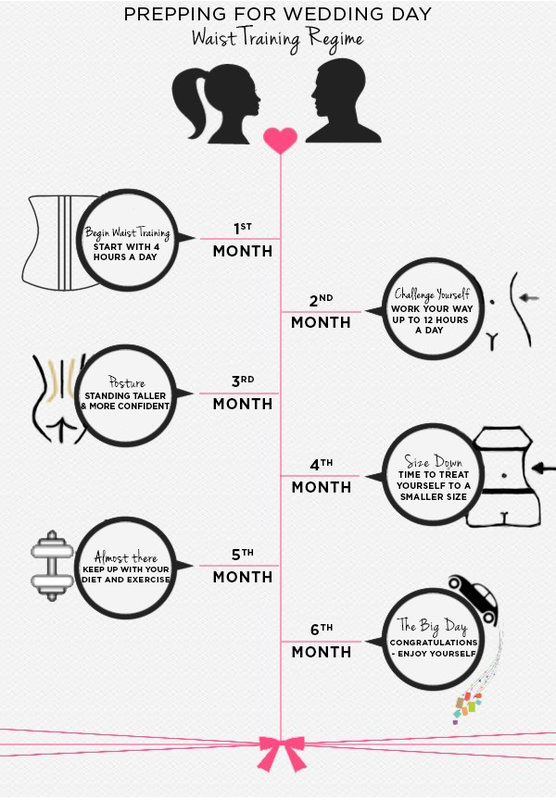 Here's our five month plan: the bridal waist cincher slim-down. First and foremost, take a "before" picture! You might be surprised just how much your body changes in the coming weeks. For some extra fun, get the whole bridal party in on the challenge! You can hold each other accountable along the way and celebrate your results together. You'll want to ease your way into waist training during this month. We recommend starting at just four hours a day and gradually adding an hour each day until you're waist training 10-12 hours a day. If you start to feel uncomfortable, break it up into smaller increments throughout the day. Don't forget that an essential part of effective waist training is a healthy diet and exercise! We know you're busy, but trust us—if you can keep up the habit now, you'll thank yourself later. Be sure to have a workout band to make your workouts more effective. By now you should feel more comfortable wearing your waist trainer for long hours. You can expect to pull the cincher tighter this month, which is exciting because it means that it's working. You may be excited to start seeing noticeable results, but don't let that be an excuse to let up on your healthy lifestyle. Continue to stay hydrated around the clock—your body, skin and hair will benefit. How's the bridal party doing? Be sure to check in with one another. Waist training should feel almost second nature now! You'll notice that you're standing taller and feeling more confident because your posture is being corrected when you wear your waist trainer. This is great news for your wedding pictures! Keep up this habit and you'll naturally want to stand tall all the time. It's time to start serious countdown in the final weeks to the wedding! At this point, if you've been sticking to your healthy eating and exercise goals, you may have noticed that you need to size down your waist trainer. Now is the perfect time to treat yourself to a new garment, which will likely be the one you wear on your Big Day. Make an event of out this milestone – celebrate a little bit with the girls! This month will be a whirlwind, so keep up the discipline with your waist training. Don't forget to keep up with your healthy diet and exercise in preparation for the big day! Be sure to have any final alterations on your dress (and the bridesmaid dresses!) completed so you can really rock it in your slim figure. And while you'll have plenty of wedding photos, don't forget to take an "after" waist training picture so you can see just how far you've come! We hope you find this timeline helpful as you prepare for your wedding! Make it a day you'll cherish forever…and hopefully you'll be in the habit of looking and feeling great no matter what the occasion.